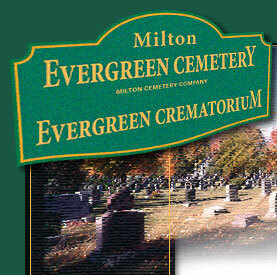 Evergreen Cemetery is operated by Milton Cemetery Co., a non-profit,non-denominational corporation formed in 1880 by a group of citizens to meet a local need. The first burial took place in 1881. The Cemetery Board continues to be made up of elected volunteer members who administer the affairs and insure the maintenance of the park-like setting. More than 8600 burials have been made on the 26 acre site which has been expanded over the years to its present maximum size.